أولاً : قرار رئيس جمهورية مصر العربية بالقانون رقم 49/1972 بشأن تنظيم الجامعات المعدل بالقانون 12/2009 . ثانياً : اللائحة التنفيذية لقانون تنظيم الجامعات الصادرة بقرار رئيس الجمهورية رقم 809/1975 المعدلة حتى الآن . ثالثاً : القوانين المكملة لقانون تنظيم الجامعات أرقام 50/1972 ، 40/1974، 50/1975، 70/1975، 100/1992، 115/1993، 82/2000 ، 12/2009 وغيرها من القوانين . رابعاً : قرارات رئيس الجمهورية المتعلقة بتنظيم الجامعات أرقام 112/1959 ، 470/1999، 112/2000، 113/2000، 200/2000، 164/2001، 165/2002، 251/2002 ، 219/2002 ، 47/2003 وغيرها من القرارات حتى الآن وتطبيقات المحكمة الدستورية العليا حتى 2009 وفهارس تاريخية وموضوعية وأبجدية بالتعديلات التي طرأت على قانون تنظيم الجامعات ولائحته التنفيذية منذ صدوره وحتى الآن . Firstly : Decree of the president of the Arab republic of Egypt for promulgating law no. 49 for the year 1972 concerning Regulation and Reorganization of Universities that amended by law no. 12 for the year 2009. Secondly: the amended executive regulations of law on the regulation and reorganization of universities promulgated by the president of the republic's decree no. 809 for the year 1975. 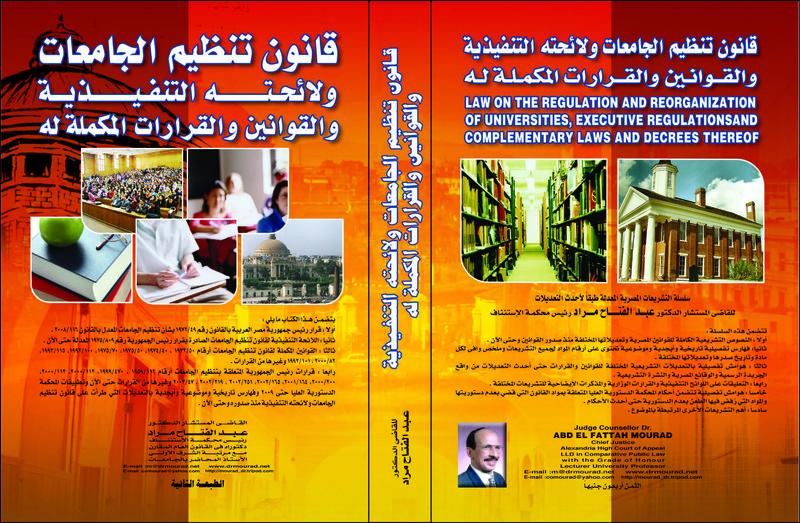 Thirdly: the complementary laws of law on reorganization of universities; their numbers and years of promulgation are as following: 50 for the year 1972, 40 for the year 1974, 50 for the year 1975, 70 for the year 1975, 100 for the year 1992, 115 for the year 1993, 82 for the year 2000, 12 for 2009 and the other laws. Fourthly: all decrees that issued by the president of the republic concerning regulation and reorganization of universities; their numbers and years of promulgation are as following: 112 for the year 1995, 470 for the year 1999, 112 for the year 2000, 113 for the year 2000, 200 for the year 2000, 164 for the year 2001,165 for the year 2002, 251 for the year 2002, 219 for the year 2002, 47 for the year 2003 and the other decrees related to this law until now. Not only that but also the applications of the supreme constitutional court until 2009. In addition, historical, substantive and alphabetical indexes concerning all the amendments of law on reorganization and regulations of universities and the executive regulations thereof since the date of its promulgation.